The topper is a mattress overlay, which consists of cold foam or visco with a moisture regulating cover. The topper gives an extra comfortable feeling. The molton / mattress protector is for use on top of the mattress. This protects your mattress against moisture absorption. 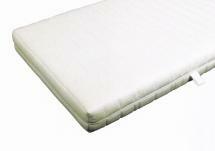 The underpad / mattress protector is for use between the mattress and the slatted base. This protects the mattress and distributes the weight.